Feel that black folk have been whited out by the media? Here are the numbers to prove it. The latest study of news coverage by the Pew Research Center shows that just 2 percent of the stories were about African Americans. The single biggest story was on the arrest of The Root's editor-in-chief, Dr. Henry Louis Gates Jr. The second-biggest story involved President Barack Obama, and 9 percent of the stories involving him had a racial element to them. The Pew study analyzed 67,000 news stories between February 2009 and February 2010 and found that just 643, or 1.9 percent, related to African Americans in some way. It may be cold comfort, but Hispanics (1.3 percent) and Asian Americans (0.2 percent) got even less media attention. We're guessing that the news media have gone post-racial even if society hasn't. As a group, African Americans attracted relatively little attention in the U.S. mainstream news media during the first year of Barack Obama's presidency — and what coverage there was tended to focus more on specific episodes than on examining how broader issues and trends affected the lives of blacks generally, according to a yearlong study by the Pew Research Center's Project for Excellence in Journalism and its Social and Demographic Trends Project. From early 2009 through early 2010, the biggest news story related to African Americans was the controversy triggered by the arrest last summer of a prominent black Harvard University professor by a white Cambridge, Massachusetts, police officer. 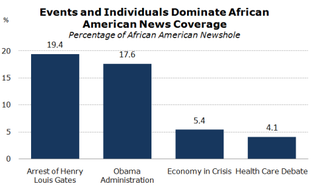 It accounted for nearly four times more African American-related coverage than did either of two biggest national "issue" stories covered by the mainstream media during the same period: the economy and health care. The study finds that 9 percent of the coverage of the nation's first black president and his administration during Obama’s first year in office had some race angle to it. Here, too, this coverage was largely tied to specific incidents or controversies rather than to broader issues and themes.